Derek refers to himself as a 'true collector.' He only buys; he never sells and just sometimes trades. It's not just a passion; it's not just a collection -- in the truest sense of the word it is his one and only Obsession. "Have you read Mitch Tuchmen's Magnificent Obsessions: Twenty Remarkable Collectors in Pursuit of Their Dreams?" Derek collects only Antique Enameled Cuff Links - strictly enameled, mind you. As of this writing, his collection has grown to 1,433 pairs and 596 singles (a cuff link who has lost his mate -- he tries to reunite them) but he reminds me that he still hasn't picked up his mail today. Dealers often send treasures via the U.S. Postal Service - his collection grows daily. In fact, the self-taught collector has become so knowledgeable on the subject that even when a piece is described over the telephone, he usually knows exactly what he is purchasing, sight unseen. He currently has the largest, most pristine and comprehensive antique enameled cuff link collection in the world -- there are no serious challengers to date. That, Derek says, is the result of hours, days, weeks and years of endless networking, searching, researching -- and just plain begging and pleading! Derek's single-minded affair with cuff links was first awakened 15 years ago when his grandfather presented him with an antique gold pair upon his graduation from The Indiana University School of Business. Moving to New York City and working on Wall Street were instrumental in Derek eventually becoming a 'Collector's Collector.' "I was in an environment where people were wearing French cuff shirts -- mainly bankers and lawyers -- a working situation that fostered stylish dressing," he explained. " The appeal is as practical as it is aesthetic. At first I collected all antique cuff links and then became more familiar with enamels. My eye naturally gravitated toward them; there is something about the gem-like brilliance of enameling that just stands out and above the rest. To me, the enamel just seems to capture the fire from which it was made." Another thing that fueled Derek's interest in collecting was the discovery of a fascinating group of like-minded individuals who collect cuff links of all types -- of which he is now the resident Enamel Advisor. The National Cuff Link Society, headed by Gene Klompus, was instrumental in focusing Derek's burgeoning passion. (Excuse me, I meant Obsession). "Gene is such a first-rate person. He helps everyone equally and with genuine enthusiasm. He has done so much for collectors, wearers, dealers and the cuff link industry. He has been one of the main catalysts in the ascent of cuff link popularity today." is the kind of guy who likes nothing better than to just call and chat for an hour about enameled links. He enjoys the camaraderie of dealing with people in the antique jewelry business and really loves to talk about what he's collecting. Because of his unique and specialized knowledge, he has clearly moved on, surpassing the veteran collector stage and become what can be considered a 'living memory' in his field." Now that Derek lives in both New York City and Ft. Lauderdale, he has easy access to antique and collectible shows year round. He is aware, from coast to coast, of what will sell in each part of the country. 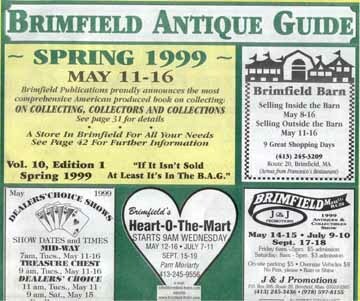 Derek eventually found his way to the Brimfield Antique Show, which has become his favorite location for searching for enameled links. "This has become my backyard. It's vacation and relaxation time for me three times a year now. It's not only the hunt for cuff links that enthralls me, I have met many fascinating and knowledgeable people who have turned out to be wonderful friends over the years. Besides, they've grown to understand me and my zealousness for ENAMELS!" Derek states that the history of enameled cuff links is still largely uncharted territory. It seems most likely that with the advent of cuff links around the early 1700s, enameled links would have been a rare sight indeed; a one-of-a-kind piece of jewelry, until the mid 1800s. Until that time, only the upper class could afford such unique, hand-wrought craftsmanship, using gold and silver. The invention of the Tour de Guillocher machine came in the early 1800s, revolutionizing the process of cuff link production. This machine could single-handedly design the cuff link's detailed metalwork patterns quickly and efficiently; eliminating the labor-intensive work that had previously been done by hand. This new invention, now enabled cuff links to be mass-produced and adorned with a beautiful, polished enamel surface in a fraction of the time. Of equal importance, with the coming of the Industrial Revolution, the enameling process could be achieved at an affordable price so that all income levels could enjoy adorning themselves with this beautiful artwork. Another factor that greatly stimulated enameling's popularity throughout the continents in this century was the Bolshevik Revolution of 1917. Russian artisans, most famously The House of Faberge, had catered to the Czar's family and other nobility. After the Revolution, these artist dispersed throughout Europe and the United States. Along with them, they took their experience in the highly specialized art of enameling and taught others their unique and expert skill. Enameled cuff links, now mass produced in volume and fired in large industrial kilns, became readily available to the general public. The popularity of the enamel designs reflected the art movement of its day and the sensibility of style within that time period. This vogue reached its zenith in the 1920s and slowly declined throughout the 1930s as new plastics were invented and enameling's labor-intensive production became cost-prohibitive. 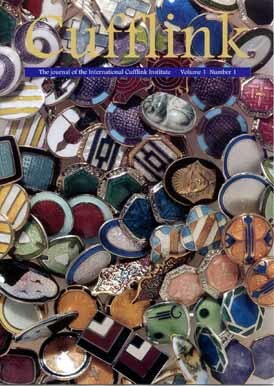 Derek mentioned that the various designs attributed to enameled cuff links reflected the artistic trend of the day. "Starting in the 1830s, with the Victorian era, cuff links were fashioned after many of the major art movements: Art Nouveau, Belle Époque, Arts and Crafts, Art Deco, and Art Moderne. Today's modern enamel designs reflect contemporary tastes as well as styles of the past, specifically the Art Deco period." "Does your collection include pieces from all of the above categories?" "Yes, I have pieces that represent every one of the major art trends. I think it's a true representation -- a museum-like coverage of the history, beauty and evolution of enameled cuff links." "When you decide to buy a pair, how do you choose? Are there criteria? What's the process?" I am very glad I stuck to my original theory for collecting enameled links which is to get there first, with adequate cash or credit, and decide promptly. If the pair makes you 'see God' and the detail, craftsmanship, originality and design have all come together -- then it's a done deal. I know within an instant of seeing a pair of links whether or not they're right. It's greater than just my subjective taste - I'm continually building upon a museum-quality collection." So Derek, when is enough, enough? How many pairs do you need? "Is it possible that you have a favorite?" "It's very hard to have a favorite. I have a lot of favorites and they all have a special meaning to me. However, there's one pair that stands out above the rest because it's the pair that I call the 'Mother of All Enamels'. Why? Because it has the image on one face of the Tour de Guillocher machine and on the other face it has an image of an industrial firing kiln. It might not sound all that exciting to anyone else, but I couldn't believe it when I found it -- a pair of cuff links bound with the actual image of its maker. Divine intervention! I think at the time, only I knew the significance and immeasurable value of this find. It was the epitome of what a collector searches for." "How do you display your collection?" "I store them in 40 portable jewelers' cases. But, I am still looking for the perfect, old antique jewelry display case -- a piece of furniture -- made of beautiful, old wood with a glass top that can adequately show off my collection." was a sight to behold -- even I was impressed. But, then I came to realize that maybe I do need to get my head examined! That's my whole retirement fund sitting in front of me!" "So, Derek, what does your collecting future hold?" 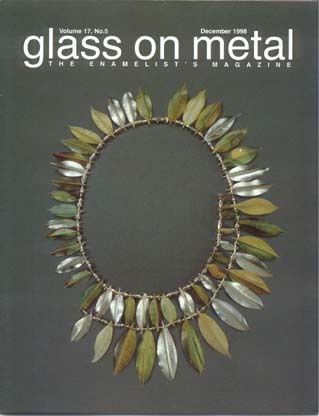 Is ground, powdered glass mixed with various oxides for color, bonded by fusion to a heat-softened metal surface in a kiln.